My kids love to chomp down biscuits/cookies for the evening snack. While that is an only indulgence or junk food that they are allowed, I was still not happy about it and started to look for alternatives and that’s when mom suggested making laddoos! I know they loved the Rava laddoos I made a few months ago, so I decided to experiment a little and try another type – Godi laddoo or Wheat laddoo. 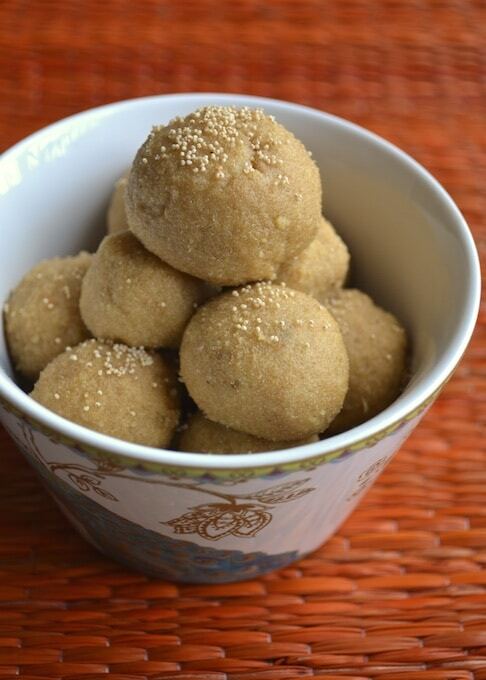 These laddoos are made out of 3 key ingredients – wheat, ghee and sugar and you can make them in less than 30 minutes. This was my first time making them and I thought they came out pretty well. My little one agreed as well and confirmed by eating 2 laddoos without waiting for them to cool down and then asked for more :). Heat ghee in a non-stick pan at medium heat. Add the wheat flour and toast it till it darkens and becomes fragrant (~7-8 minutes). Add the sugar and cardamom powder, mix well and remove it from heat. Allow the mixture to cool down slightly. 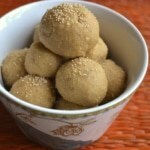 Shape them into laddoos or balls and set them aside on a plate to dry. If the laddoos are not shaping well or crumbling, grease your palms with ghee. Thank you for the recipe.Am goin to try it today!! You are welcome, Prithi. Thanks for stopping by.